I am going to teach you secrets that can save you a lot of money advertising on Facebook. You will learn how to set up effective audiences for your Facebook ads. The most successful e-commerce and SaaS businesses use these strategies to get higher conversion rate and sell more using Facebook. When you set up an ad or boost a post on Facebook there are two factors that impact the results. The group of people you promote the content to. You get the best results when you tailor the content to the recipient and they end up being a perfect match for each other. Let's say you promote a guide on how to become a great leader for a group company founders. That's a good match. I will explain how to target the people most likely to find your content relevant and valuable. I won't talk about how to create the content in this guide. 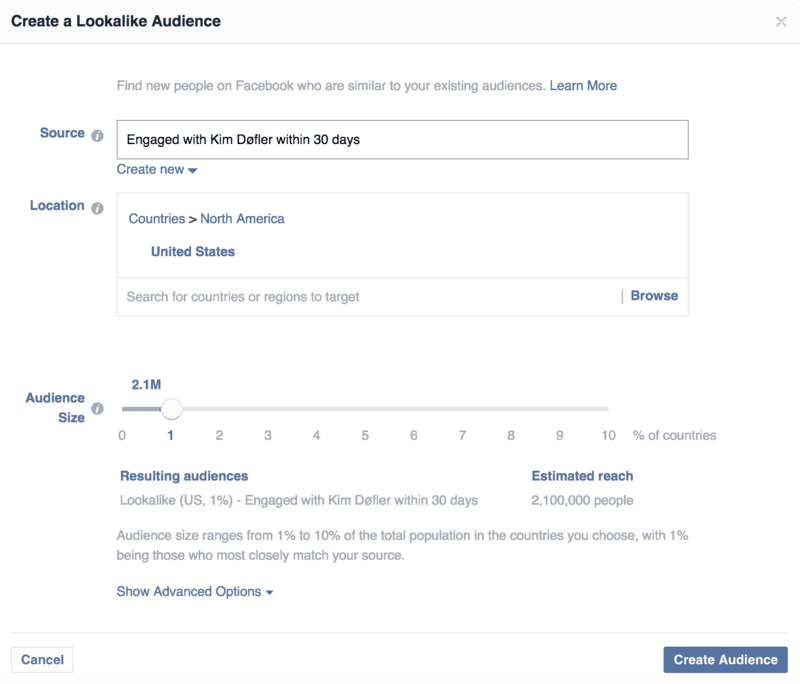 Facebook has a great amount of targeting options for creating audiences. This can be useful if you are starting out with a new business and have no traction. This is not the most effective though. If you have a website or Facebook page it is much more effective to make audiences of people who interacted with these. Here you will learn how to target people who have already interacted with your company's website or page. I will also show you how to make audiences of people who are similar to those people. This will allow you to expand your reach and make new leads for your business. Facebook ads can be a great way to follow up on existing customers or people who came by your website. It's completely normal for people to need some time to think before taking action on an offer on your website, so they leave your page with the intention to come back later. Even with the intention to buy people often forget and their life goes on. Therefore it can be valuable for the potential customer to be reminded of your offer with a relevant ad. Since this is a warmer lead it can also be profitable for you to retarget the visitor, since they are more likely to convert than a complete stranger. 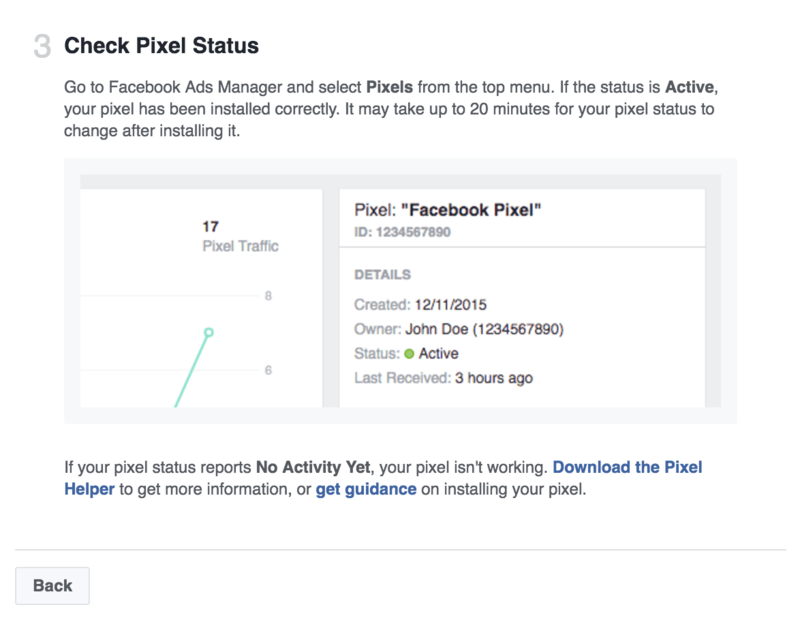 To start creating audiences based on your website visitors all you need to do is to install Facebook's tracking pixel. This will automatically track visitors navigation around your site if they are logged into their Facebook account in that browser. You don't need to send in any information about the user since Facebook does most of the heavy-lifting. They use a cookie to track that the user has been on the page. Therefore it is recommended (and in europe mandatory) to inform the visitors that you are using the pixel in the privacy page of your company website. The pixel will not only track where your visitors go on your site, but it can also track particular actions they do. For example if they add a product to the basket or they sign up for a trial. This way you can make different targeting audiences based on actions people took and for example retarget only people who actually put something in the basket and didn't buy. To get a pixel you need to go to your ads manager on Facebook. Here you need to open up your own account which should get you to a screen containing all your ad campaigns. Then click the "All tools" button in the lower part of the menu. This will expand the menu and show all the available features. Move your mouse to the right and click "Pixels" under the "Assets" pane. Since my pixel is already set up, it might look different than your screen, but when you get to the pixel page you should look for a button saying "Set Up Pixel". You can pick the option that suits you best, but a very simple way to get it done is to pick the lower option (Copy and Paste the Code). To get the script just copy the one that is on the screen and insert it using the plugin below. Alternatively, if you have a WooCommerce shop and want to track more advanced events, I know Pixel Caffeine By AdEspresso can do most of the things. After you have installed the pixel on your website, you should check it is tracking correctly as mentioned in step 3 (See image below). I also recommend that you install an extension in your Google Chrome browser. This extension allows you to check that your pixel is set up correctly. In the next section, I am going to show some other cool ways this extension can be used to learn from your competitors. 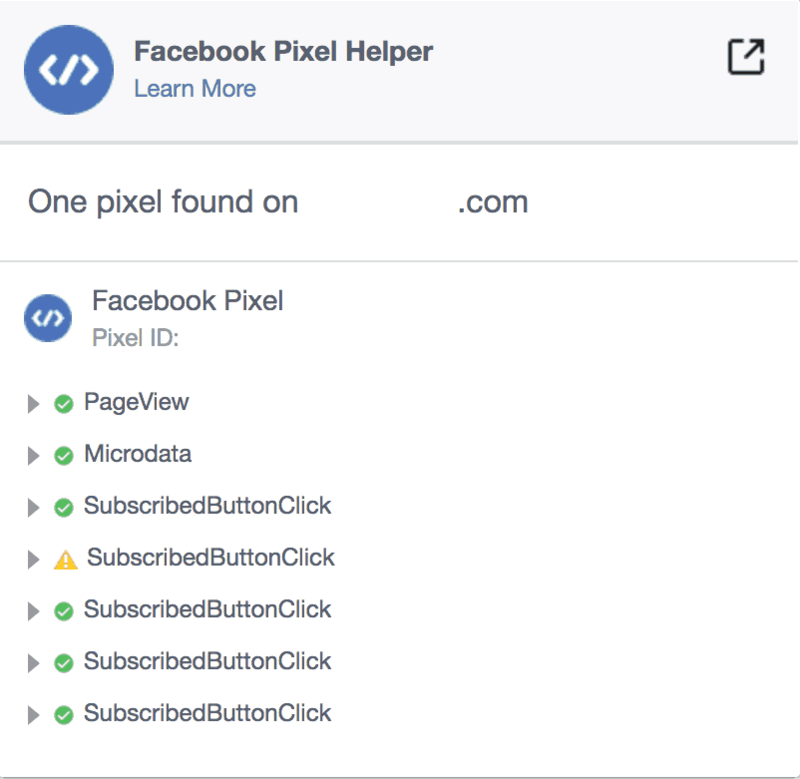 Install the Chrome extension for free: Facebook Pixel Helper for Google Chrome. When you have confirmed that your own page is working correctly, you can use it to learn what your competitors track about their customers. The tool you just installed to confirm that your website is set up correctly, can be used to learn what your competitors track about you and their customers. Go to any of your competitors' website. I recommend you go to the website of the competitor you consider most web-savvy. Pay attention to the Facebook Pixel Helper. When the website sends information off to Facebook, the number on the icon will change. Click that icon and a window will pop open. Here you can see everything that the website is tracking about you. Try putting something in the basket, checkout, and buy something. Pay attention to what sort of things they track, and try imagining how they use it later, in their ads. Here you can see an example of what Fiverr.com tracks. They do a particularly good job at tracking. Notice how they track that I am a "buyer" (as opposed to a seller on their platform) and what category I am browsing at the moment. It can be very useful to have a bit more context about a visitor when creating audiences. For example, if you know a person browsed a category with a lot of graphical content you could show ads that are more visual to this group of people. Keep in mind that you don't send in any personal or sensitive information. Use it for identifying what the person would find relevant and valuable. In this section, I will let you in on one of the most effective features on Facebook. Using this method you can promote your content to people who are similar to your current customers or website visitors. This is really powerful since it lets you expand your reach while still keeping it very relevant to the people seeing your ads. If you already have an audience of customers who bought your product you can use this feature to create a new audience of potential buyers. Using advanced algorithms, Facebook helps you find the right people to see the ads. So to rephrase this feature creates an audience of people on Facebook who is similar to people in one of your audiences. That raises the question of how to make the initial audience. As mentioned it can be based on visitors, who bought something on your website and then you will get a new audience that potentially would love to buy your products as well. 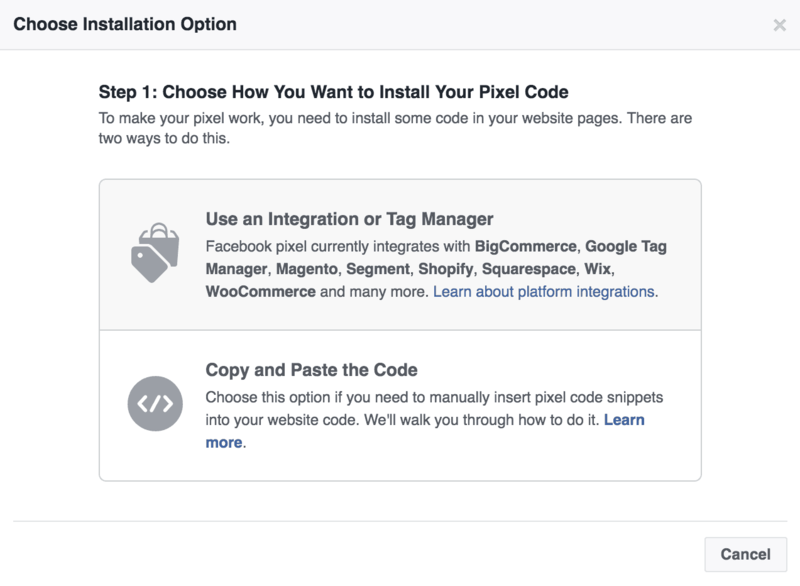 So one way to do it is with the Facebook Pixel installed and trigger a conversion event during checkout. Alternatively, you could make a custom audience from the email addresses of your current customers. Keep in mind you need their consent before you use their email address for promotional content both email marketing and on Facebook. 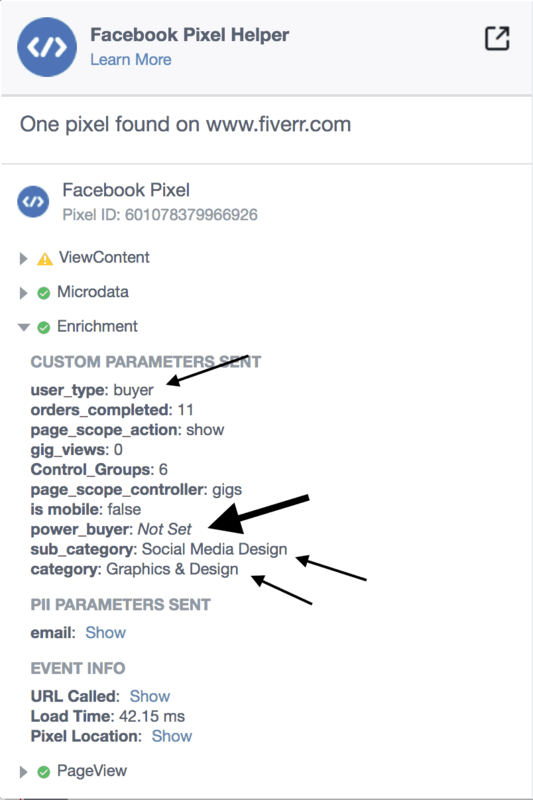 If you have the simple Facebook Pixel installed on your page, but no advanced conversion event tracking, you can still make an audience of buyers. For example, if you know all buyers end up on a certain page after the purchase e.g. "doefler.com/thank-you" or "doefler.com/order-complete" or something like that, you can use that as a trigger. To make a new audience click this button on your Pixel page. In this GIF animation, I show how you can make an audience based on visitors who visited a certain page in my page. You could do the same for your web shop. 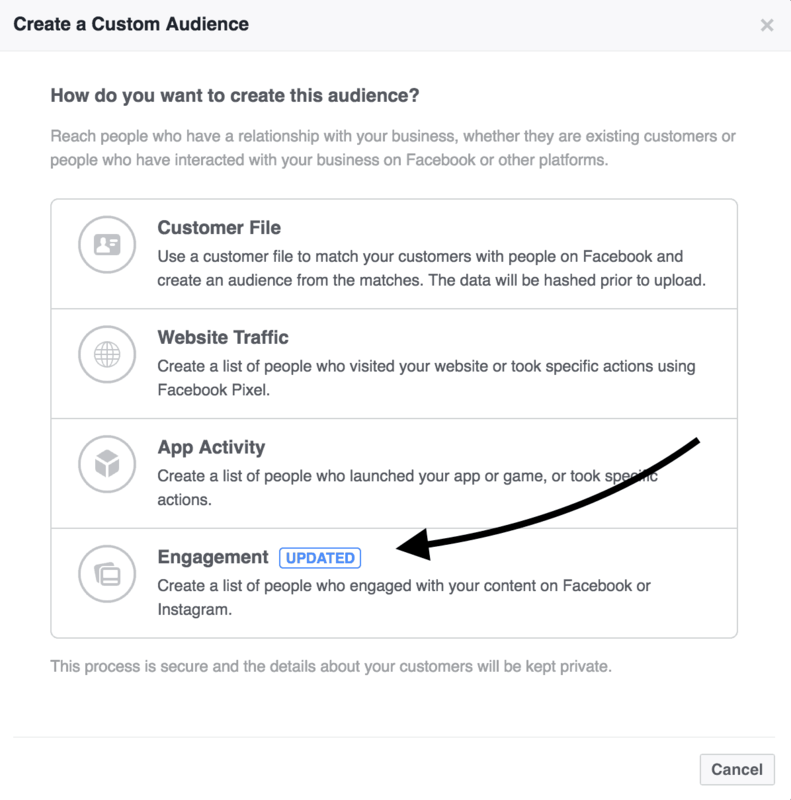 When you click "Create Audience" Facebook will create a new audience and start populating it with people who already visited the page and keep monitoring your page in the future. This makes it a very smart way to track because it works retroactively. When the audience is created you can make a lookalike audience based on it. All you have to do is to click the "Find new people similar to your existing users" button. Alternatively, you can always make lookalike audiences from any custom audience from the "Audiences" page. You can access that from the header menu. In the top of the "Audiences" page, you will see a menu that allows you to do several useful things. If you click the "Create Audience" drop-down you will find the "Lookalike Audiences" feature. This is my go-to place for creating lookalike audiences. When you click the Lookalike audience button a modal view will show up. 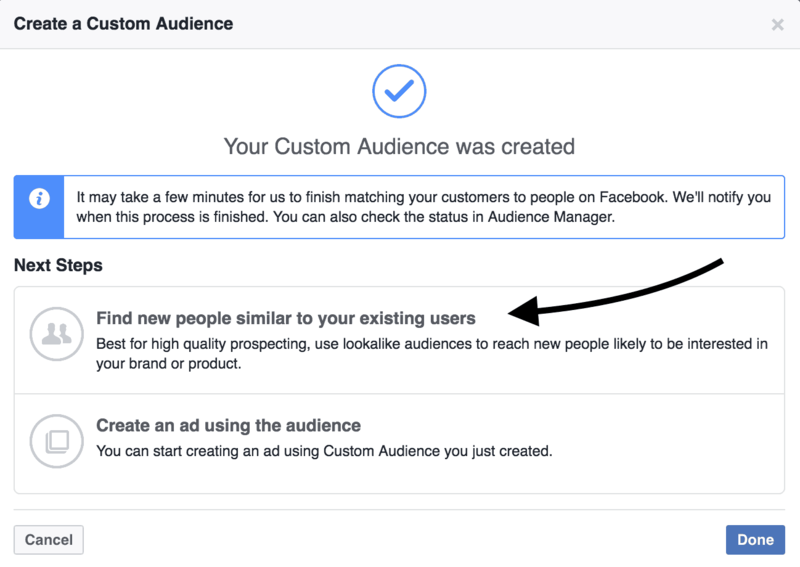 Here you can pick any of your existing custom audiences and the countries Facebook should look for similar people in. Just start with the standard settings. When you get more advanced and have a bigger budget you can experiment with the Advanced options. For example, you can make different lookalike audiences that reach further. This will decrease the relevancy but make the audience much bigger. When you are done hit "Create Audience" and wait for Facebook to do its magic. It will take Facebook a couple of hours to populate the lookalike audience. This will also be updated with future buyers from the custom audience. In the next section, I will teach you how to make lookalike audiences even if you don't have a massive list of buyers already. If you already make lookalike audiences but don't feel like they work, maybe it is because your custom audience is too small. Facebook recommends making lookalike audiences based on audiences with between 1,000 and 50,000 people. If you have a smaller web shop or are doing more premium B2B, then you don't have enough data for Facebook to draw significant conclusions and find similar people. To make better audiences, all you need to do is to make a bigger custom audience. You can do that by moving up the funnel and base it on high-purchase-intent people who haven't bought yet. How do you know if people have high purchase intent? Combining these groups of people you will have a much bigger audience. You can make this audience using the Facebook Pixel as shown before. Even if the group of people is higher in the funnel, it will still make sense to let Facebook use them as the input for their algorithms. In the end, you will end up having a much higher converting audience. When you are on the Audience page you might as well make an audience based on the people who engaged with your page and/or your page posts. It is super easy to make this kind of audience. Start by going to the "Create Audience" drop-down. Here you click the "Custom Audience" button. This will open a modal view with different options. 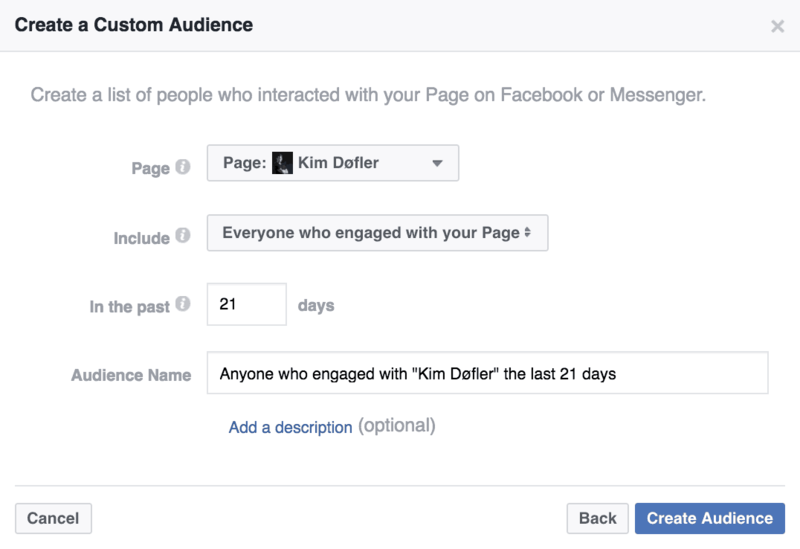 Click the "Engagement" option to make audiences based on interactions with one of your pages. In the next view, you click "Facebook Page" (the other options are also really interesting to check out later) and this will take you to a new view. In this final step, you pick the page you want to base the audience off and what sort of engagement you find important. In this case, I chose any engagement within the last 21 days. Keep in mind that the shorter the time interval the smaller the audience will be and therefore the less chance of making great lookalike audiences. On the other hand though if the time interval is too big you might end up targeting people who don't remember who you are and/or don't care anymore. This is particularly important for seasonal products as well as products that are associated with life events like marriage, birthdays etc. Keep in mind that the shorter the time interval the smaller the audience will be and therefore the less chance of making great lookalike audiences. When coming up with an Audience Name, be sure to make as descriptive and self explanatory as possible and try to come up with a format you use every time and stick to it. That will make it much easier to keep track of things further down the line. It also makes it much easier if you are working together with other marketers in a team. To learn how good a fit you have made, you can test different variations and compare the cost per action. Another way to see how good a fit you got is to look at Facebooks's "Relevancy Score" metric. This is Facebook score for how relevant they think your ad is for the chosen audience. This metric becomes available after an ad has got 500 impressions. Relevance score aggregates various ad quality and relevance factors to give you an idea of how relevant your ads are to the people in your target audience compared to other ads targeting that same audience. These factors include positive feedback (ex: clicks, app installs, video views) and negative feedback (ex: someone clicks "I don't want to see this" on your ad). It uses a 1-10 scale in which 1 means your ad is much less relevant than other ads targeting the same audience, and 10 means your ad is much more relevant. You'll be able to see this score once your ad has had about 500 impressions. It is completely natural that people will interact more with content they feel is relevant to them than content that doesn't. Therefore you will get more interactions. In most cases that also means higher conversions and revenue in the end. Furthermore, Facebook will also lower the cost per action (CPA) if they see that it is easy to get interactions on your content. This is because they are sure to get their revenue from your ads. Imagine the opposite for a moment. If someone promotes their content on Facebook and it gets very few interactions and Facebook gets paid per action. Then they would need to show it much more people resulting in a much higher cost per action. Bottom line, better fits means better conversion and cheaper ad promotion. One of my favorite features of the Audience page is to see the overlap between audiences. You can access this feature from the "Actions" drop-down. 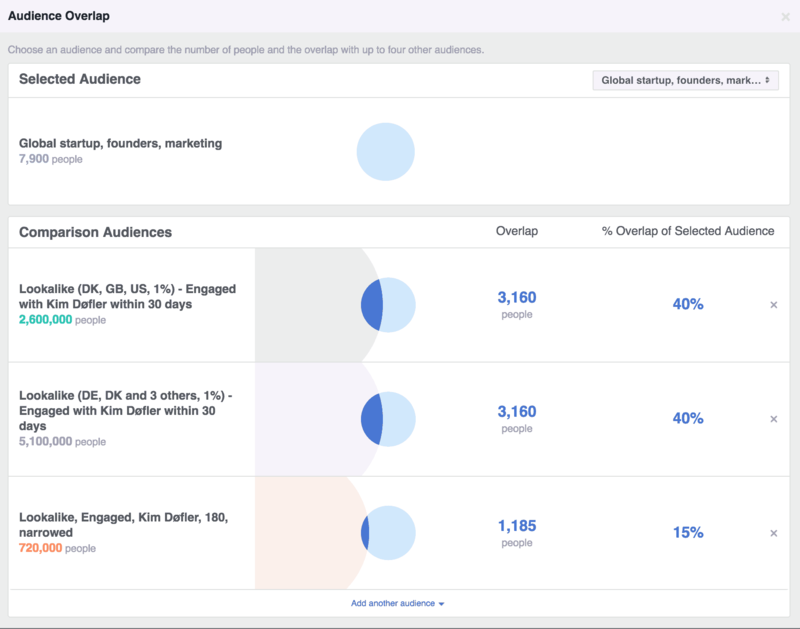 This tool lets you see how different audiences overlap with one base audience. So first you pick the audience you want to use as the reference. Then you add other audiences to compare with that one. The reason this is so useful is that it lets you see which of your audiences has the most significant overlap with your custom audience of purchasers. Imagine you create 10 different audiences including lookalike audiences and then you have one audience of people you know have bought stuff. Now you can see which of your other audiences are most similar. I use it as a way to benchmark my new audiences. Make a custom audience based on either Pixel or Emails. Make a lookalike audience based on the first audience. Make a saved audience from the lookalike audience and exclude interests, behaviors, locations, gender, age groups I already know won't convert. Then I confirm my idea using the overlap tool and see if the overlap is bigger between the saved audience and the custom audience than between the lookalike audience and the custom audience. Experiment with the tool, it is really interesting and can be quite useful to identify errors and bad targeting options. I hope these hacks gave you some new marketing superpowers. If you need help setting this up for your company, let me know. 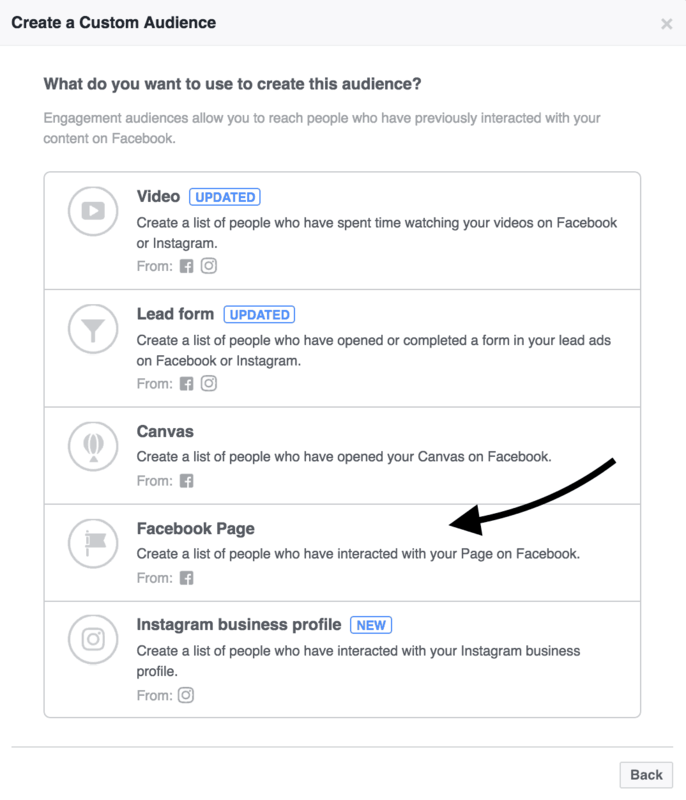 And if you need some inspiration to how you can target your audiences even further and make sub-audiences, you can check out my complete reference of Facebook targeting options.